This exquisite hand made area rug from Rug Agent is just what you need to warm up your holiday decor! Add elegance to any room of your home with this high quality piece. 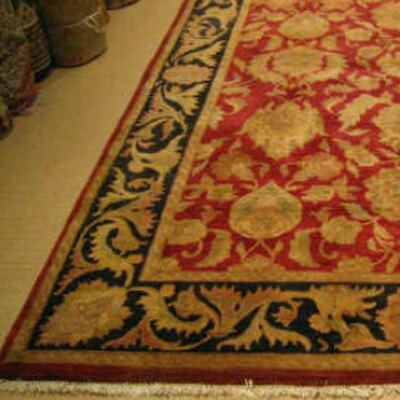 Originally priced at $5,400.00, order your hand crafted area rug today and pay just $1,600.00! That is less than 1/3 of the list price for this quality piece. This 9 ft. x 12 ft. area rug is large enough to cover the floor of an entire room. Use it to create a separate sitting area in larger rooms as well. The red and gold center of this elegant area rug is surrounded with a darker leaf design for contrast and character. Measures approximately 8 ft. 6 in. x 11 ft. 6 in. This impressive area rug will add elegance and charm to your sitting area, bedroom, or other area in your home. Use it to provide a luxurious cover over your bare floors, or create a polished look when you place it over existing carpeting. Order yours today! The colors would be perfect for the holidays. Having this rug in our home would add a great touch to it. So true Buddy Garrett ,I have my eye on that as well….